Judy Flynn as Josephine, Samantha Power as Christine and Simone Saunders as Jennifer in Chicken Soup. Photo by Mark Douet. Chicken Soup, a tale of five women and their community across three decades, is showing at the Crucible’s Studio theatre until 3 March. 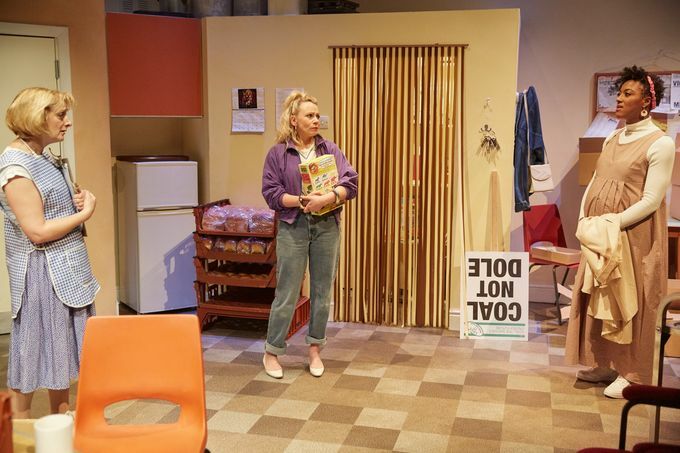 Set locally, just a few miles from Sheffield in Rotherham, audiences join Christine (Samantha Power), Josephine (Judy Flynn) and Jennifer (Simone Saunders) the week following Orgreave as they prepare to feed a struggling mining community. Their community kitchen becomes a mainstay of their lives throughout the show – a place where friendships and families (Remmie Milner joins the cast as Jennifer’s daughter, Katie) are born and grow. Times change, the world changes – the soup kitchen becomes the venue for a jubilee party in 2002, and then a food bank in 2016 – but the women remain friends throughout. Local writer Ray Castleton and Kieran Knowles (Operation Crucible) may have produced a play that focuses on a community that has been well documented, but Chicken Soup looks at the lives of the women in mining communities differently. At is core, is a story of female friendship, through the bad and the good, both in their personal lives and the wider political world. Sophia Simensky’s set carries the play throughout, its subtle changes over the decades perfectly places us in each of the years we meet the women. Whilst the standout performance has to be Remmie Milner’s portrayal of stroppy teenager Katie, complete with Nokia 3310 and Snake obsession, who later grows into an assertive, intelligent young woman with a passion for remaining in the EU – much to her mother’s dismay. Chicken Soup is showing in the Crucible Studio until 3 March, tickets are still available on the Sheffield Theatres website. Love theatre? See what other shows are coming to Sheffield Theatres this season or check out what’s coming up at Theatre Deli.